All of my unique puzzles are handcrafted from quality materials, with each piece cut individually. Each wooden jigsaw puzzle starts with defect free 1/4" plywood which serves as the base of the puzzle. The puzzle's art is then adhered to the plywood using a high quality adhesive, ensuring a reliable and permanent bond. The puzzle blanks are then treated with a finish that defends against damage from moisture, UV light, and smudging. Excluding some of my guestbook puzzles, a protective finish is also applied to the back of the puzzle for added durability. My wedding and event guestbook puzzles are made from 2"x2" pieces which is an optimal size for your guests to sign and leave a brief personalized message. Heart shaped interlocks are typically used, with an average of eight interlocks per puzzle piece. This number of interlocks is a great balance betweeen a fun degree of difficulty and optimizing the signable area of the puzzle. For those who wish to have a more challenging cutting style it is available upon request, however it will reduce the overall signable area of the guestbook. Visit my Wedding Puzzles page to learn more about my wedding and event guestbook puzzles. There are two basic cut styles that I offer; a traditional style cut similar to those used in most commercially made puzzles, and a random cut style. The traditional cutting style is best used for small children, while the random cut style greatly increases the degree of difficulty in order to make the puzzle more challenging and enjoyable to solve. More information on personalized jigsaw puzzles can be found by visiting my Traditional Wooden Puzzles page. 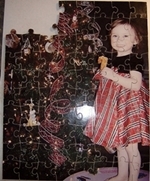 What is included with your Custom Wooden Jigsaw Puzzle Order? Personalized label on the box lid with a custom message that you provide. Personalized figural pieces that you select based on the recipient's interests (Wicked and guestbook puzzles only). Free basic editing of your photo to produce the best results. Two or more ultra fine point markers are included with all of our Guestbook Puzzles. (Typically Black, but additional colors may be available upon request).